what size harness does my dog need? The UdogU Easy On Harness is designed specially for smaller dogs, to avoid the trachea problems that can arise from stubborn pulling on a collar. Our harness fits dogs from under 3 lbs. up to approximately 45 lbs. Like all great attire, the UdogU Easy-On Harness depends on accurate measurements for the perfect fit. Different breeds have different "figure profiles", so weight alone may not tell you which size you need. Slender breeds (dachshunds, for example) will need a smaller size than stocky breeds (such as pugs) at the same weight. Your dog's ribcage measurement is the best guide to harness size. Please measure around your dog's ribcage just behind her front legs, as shown in the photo, then refer to our Harness Sizing chart. You may find that two different sizes will fit your dog. Normally, the best size to select will be the smaller of the two sizes. But don't worry - with our Harness Fit Guarantee, even if you select the wrong size, we'll exchange it for you. Please measure your pet carefully. Be sure to base the size on the ribcage measurement, not the weight. It will save you from returning the harness for a different size. The Teacup size uses 3/4" webbing and is for dogs weighing about 2.5 - 4 lbs. 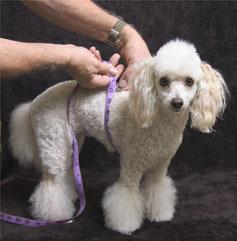 The Teacup Plus size uses 3/4" webbing and is for dogs weighing about 4 - 7 lbs. The Toy size uses 3/4" webbing and is for dogs weighing about 6 - 9 lbs. The Toy Plus size uses 3/4" webbing and is for dogs weighing about 8 - 11 lbs. The Small size uses 3/4" webbing and is for dogs weighing about 10 - 15 lbs. 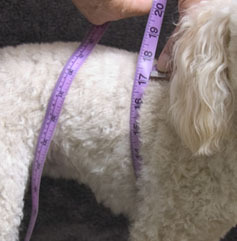 The Small Plus size uses 3/4" webbing and is for dogs weighing about 14 - 19 lbs. The Medium size uses 1" webbing and is for dogs weighing about 18 - 24 lbs. 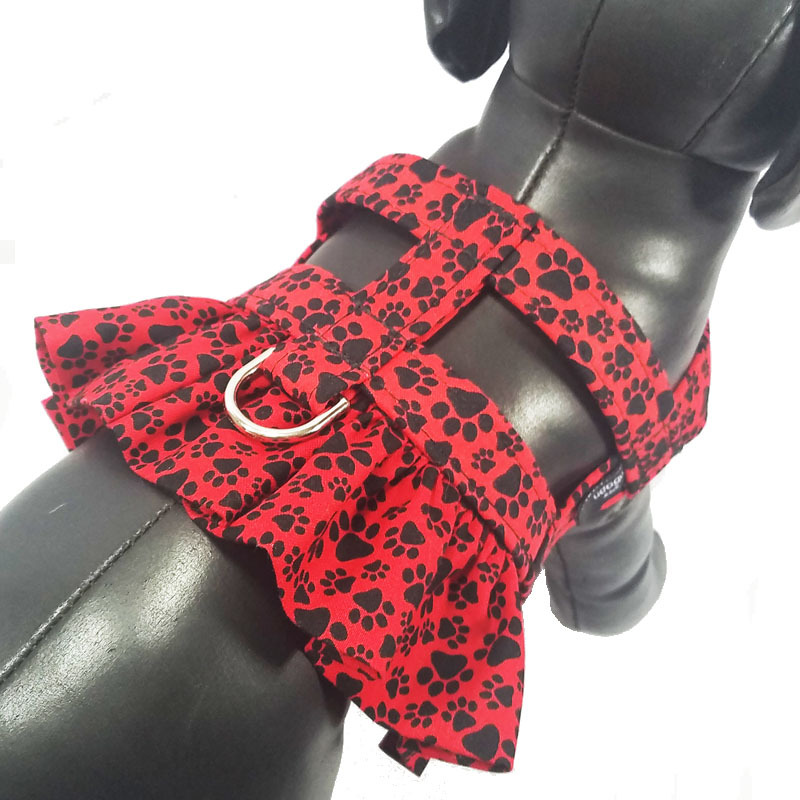 The Medium Plus size uses 1" webbing and is for dogs weighing about 23 - 30 lbs. The Large size uses 1" webbing and is for dogs weighing about 30 - 45 lbs.